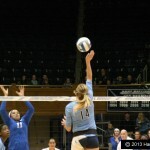 This week’s NCAA Women’s Volleyball rankings confirm that the UNC Tar Heels are a serious contender for national honors as they appear at # 6 in the weekly rankings. Carolina is 18-2 and are an undefeated 9-0 at home as we enter the last full month of the regular season. Carolina travels to Boston to take on Boston College (at team they swept on Oct. 24) before returning home to Carmichael Arena for a match against Virginia Tech on Nov. 9. Schools & athletic organizations depend on VolleyballTape.com for high quality tape for temporary gym floor volleyball layouts. We feature Shurtape P-724, with a residue-free adhesive and also offer a variety of other pro-quality floor tapes. Volleyball tapes are easy to apply, easy to remove and ready to ship today.